Last week was crazy at my house. It was Spring Break and I had all six kids at home by myself (since their dad was out of town on business for the entire week). The weather was anything but Spring-like, so we spent a lot of time inside trying to think of fun things to do. When I wasn't trying to calm the whirlwind that is my children I enjoyed looking through your projects. A great big thank you to everyone who is supporting this link up and who returns every week to share their ideas, thoughts and projects. I really appreciate your help in making this party a success, so please keep coming back and invite your friends; share via social media. 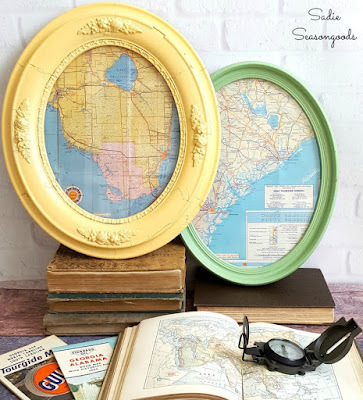 Sadie Seasongoods shared these Antique Oval Framed Vintage Road Maps. Across The Boulevard used an upcycled bottle for a vase and created these stunning Easter Egg Floral Branches. 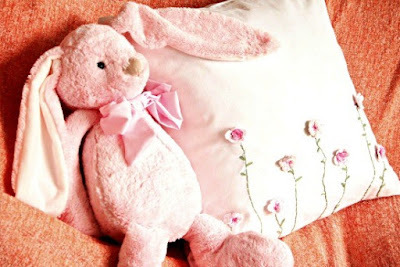 Of Faeries and Fauna Craft Company showed us how to make this DIY Spring Couch Cushion. Check out the delicate crocheted flowers! 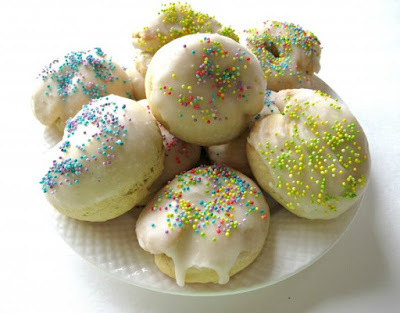 The Monday Box shared their recipe for Italian Easter Cookies. Yum! 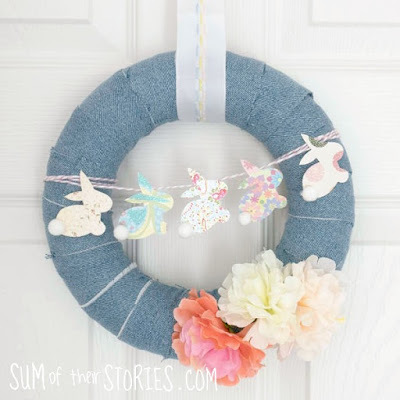 Sum of Their Stories used upcycled jeans to create this sweet Spring Easter Wreath. 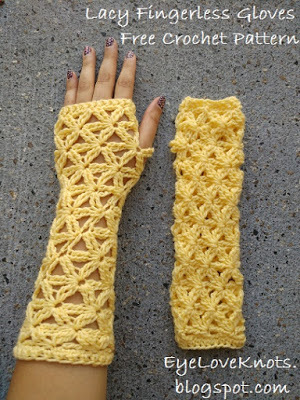 EyeLoveKnots shared a free crochet pattern for these fancy Lacy Fingerless Gloves. 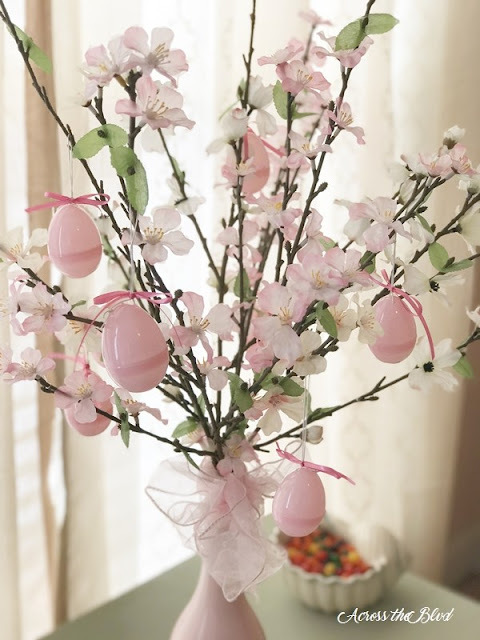 Thanks so much for including my Easter Egg Floral Branches in your features, Julie! Thanks for hosting. 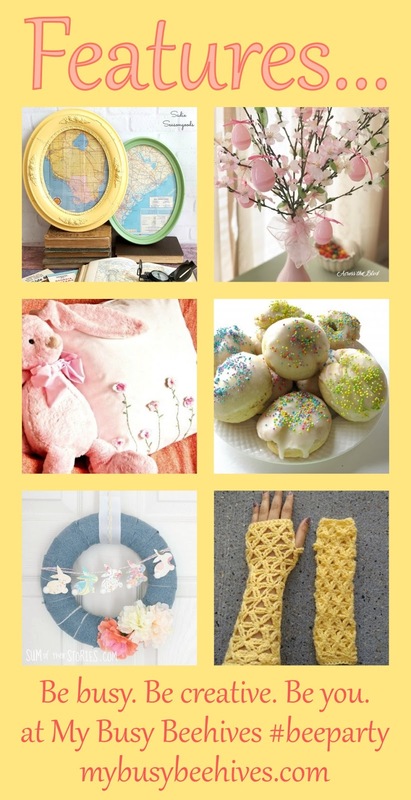 I hope you have a wonderful week and a Happy Easter! You're welcome, they were beautiful! Have a great week! Welcome! I'm so glad you found us. Hi there, I`m a first timer too. So excited to be here, and thanks for hosting! Great! I'm so glad you're here and are helping this party grow! Pleae come again. Thank you so much for the feature. It is very much appreciated. Thanks for coming Marilyn, Your parties are fun, too! The weather in Utah has been teasing us- it looks warm and sunny most days, but has actually been too chilly to be out in it much. Soon, I hope! I'm ready for sandal weather! Thanks for stopping by this week.